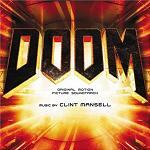 As a film adaptation of a video game, the movie "Doom" is not exactly Hollywood's finest hour and nor is it intended to be, but the film's soundtrack features an interesting score from composer Clint Mansell for which we should indeed be grateful. A film such as this requires atmosphere, and plenty of it. Mansell opts for an ornate rock feel, ambient drones, big basslines, and dark shadowy experimentation. He borrows the rock texture from Nine Inch Nails and relies on his electronic patterns to do the rest. The most interesting aspect of the score is the sheer depth of sound, sounding like some parts were performed in some underground lair. Unlike his scores for the Darren Aronofsky movies "Requiem for a Dream" or "The Fountain", Mansell's "Doom" relies more heavily on ambient textures. "C24" opens the score beautifully, acting like a mini-overture and setting the tone, with electronic chimes and sweeping violin reverberating throughout a 40-second dreamlike pattern. The main title "Doom" and "Facing Demons" spoil the fun, predictable in their composition. These tracks speak for themselves, Mansell obviously created them to suit the tastelessness of the actual movie. "Sibling Rivalry" counteracts this by plunging us into total darkness, with strange metallic sounds and a stressed bass as our only friends. These types of tracks, on the other hand, represent the best aspects of Doom. Tracks such as "Resurrection", "Lab", and "Semper Fi" follow the same footsteps with increasing subtlety, as well as background rumbling, trembling notes, whispering, and strange hissing noises. "BFG!" (stands for Big F***ing Gun apparently) and others like "Superhumans and Monsters" reveal Mansell in a more energetic mood, switching between upbeat thuds and dark clattering atmospheres. It might be interesting to point out that there are similarities with early Autechre material on a purely technical level. Mansell demonstrates his interest in using rhythmical backdrops with a strong presence of ambient drones. It makes sense when you think about the fact that he used a piece of music from Autechre's 1993 album Incunabula in his Pi soundtrack in 1998. This can be felt in tracks "Searching" and "Let God Sort' Em Out", the latter being the best track on the entire score. It could also be argued that Mansell possesses a comprehension of sound that isn't that far removed from experimental electronic musician Richard Devine, in that he is able to craft atmosphere in a multi-dimensional manner, making the whole sound like it was performed in an imaginary landscape. ...Let God Sort Em' Out"